It was because of Jan Mark that I became a children’s author. I didn’t realise it at the time but now, looking back thirty years, I can see that it is true. 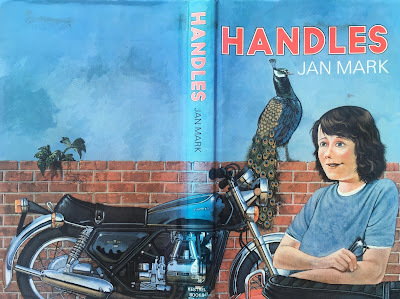 HANDLES won the Carnegie medal in 1983. Jan had already won the Carnegie in 1977 with THUNDER AND LIGHTNINGS. These two books, along with a third, UNDER THE AUTUMN GARDEN (which was highly commended for the Carnegie) were set in the Norfolk countryside. 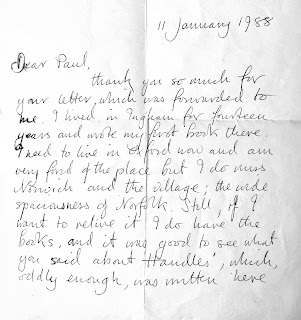 I had lived in that Norfolk countryside for a dozen years by the time HANDLES was published, and I had known Norwich since childhood. But I had never seen anyone manage to recreate the Norfolk experience so vividly in print. Norfolk dialect is notoriously hard for any actor to reproduce on stage or screen if they are not a native, and equally hard to put into words. Jan Mark managed it, and in HANDLES she took it to a new level. 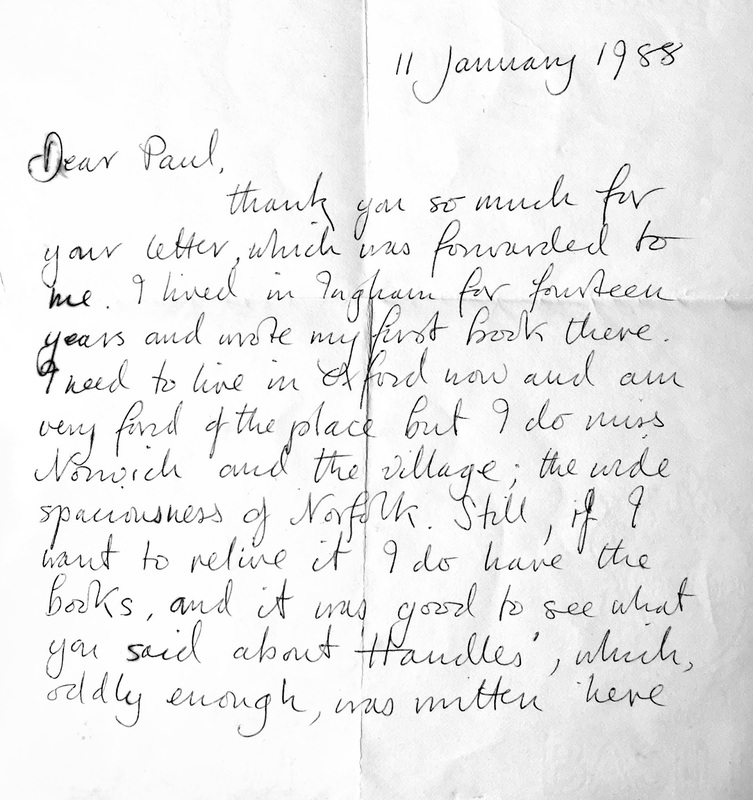 And so the idea entered my head that it was possible to write books for children set in Norfolk and I started work on a story that eventually became my third novel GREEN FINGERS. In the course of writing it I kept realising that I had accidentally stolen ideas from Jan Mark. I thought I had removed all traces, but later realised that Rain, in my book of the same name, is a young girl who is mechanically gifted, just like Erica in HANDLES. I told Jan all this when I eventually met her, complete with fag and glass of wine, at some party somewhere. She laughed and said that it’s just the way things are. It happens to everybody. It’s a good thing. I told her we’d written to her all those years before. She looked alarmed. 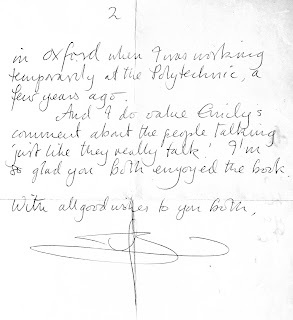 ‘I did write back, didn’t I?’ she asked me. 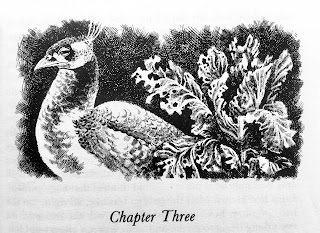 Chapter head illustrations for HANDLES were by David Parkins, who also provided the cover for the hardback first edition. 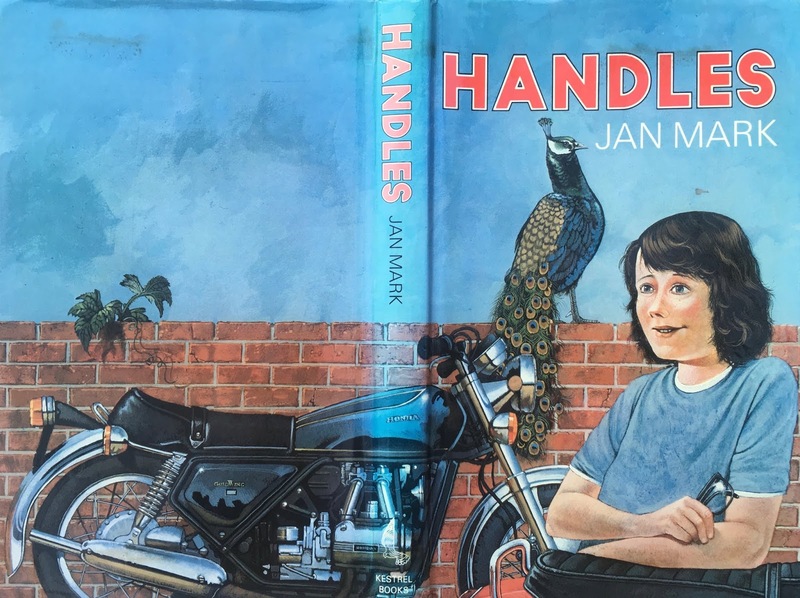 He also illustrated NOTHING TO BE AFRAID OF, Jan Mark's book of short stories which was highly commended for the Carnegie in 1980. David Parkins went on to draw The Three Bears and Billy Whizz for the Beano, and Desperate Dan for the Dandy. ‘You want him to think about something,' Robert said, shoving his oar in, ‘you got to give him a week’s notice. Time you get back, he’ve started to think about that.’ He grinned, as if he’d come up with something clever. Erica withered him privately. Jan Mark’s genius is to let us both sympathise with Erica’s impatience with her country relatives, and at the same time see the humour (and perceptiveness) in their conversation. All is not quite as it seems in the adult world that Erica is keen to join. 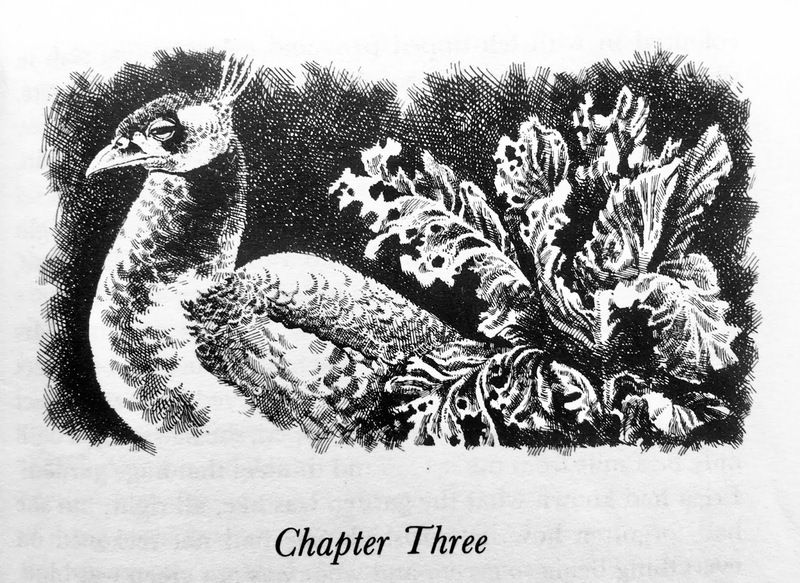 Her relatives’ battles with the peacock that ravages their vegetable garden are comical, but the family rely on the money they make from selling the vegetables. Elsie, the affable, absent-minded motorcycle mechanic, has an unhappy wife and an unhappy daughter. Behind the nicknames and the jokes, real life is lurking. Erica’s stay a small Norfolk village is as revealing and transformative as any visit to a foreign country. 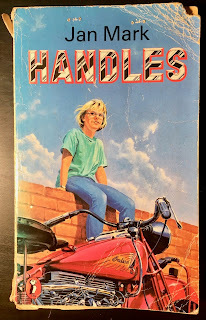 HANDLES is a wonderful book, and I wish I had written it. 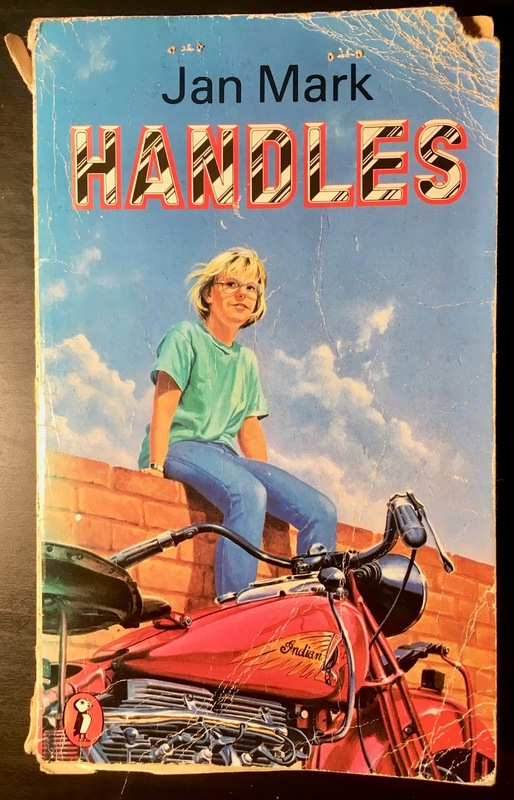 HANDLES is currently out of print. Thank you for this, Paul. 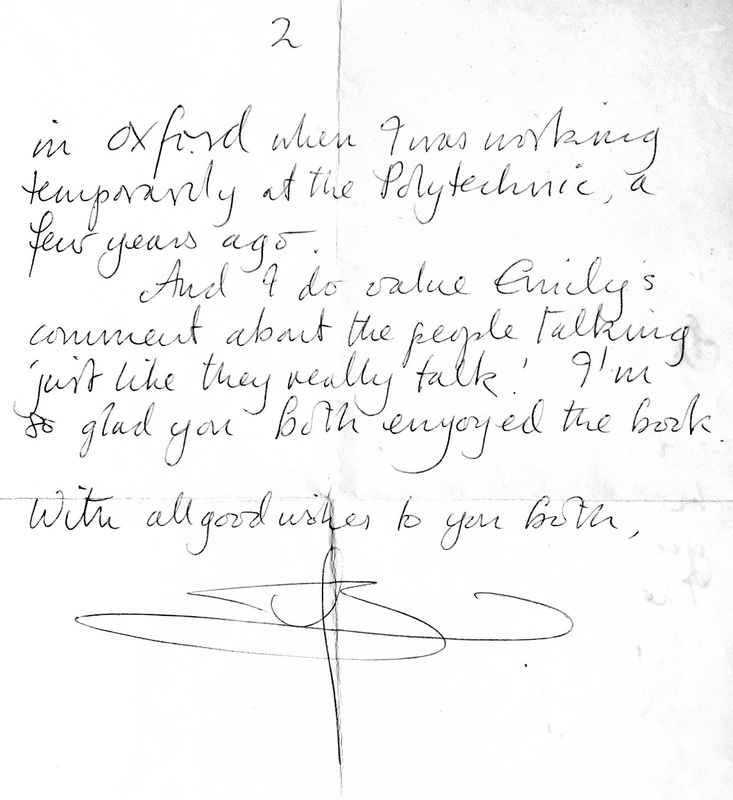 I was lucky enough, many years ago, to be tutored by Jan Mark on a writing course. It was an incredible & influential experience. Thanks, Ann. Let me know if you can't find a copy. I have a spare! And, Penny, I too feel lucky to have met her. Thanks, Paul - it seems to be out of print, but I found a secondhand one on Amazon. I'm shamed to say I've read hardly anything by Jan Mark. What would you recommend to start off with? I would start with her first book Thunder and Lightnings (still in print). I was in the children's bookshop in Muswell Hill today and they didn't have a single one of her books. The short stories in Nothing to be Afraid Of are classics too. And Handles of course. I did enjoy The Eclipse of the Century too. Very different.